There are those who climb mountains, and a few who would risk climbing an active volcano. If you are among the intrepid few, here is a volcano climber’s experience. Our feet move over quickly over the black, volcanic soil. Our packs are light, with just a lightweight sleeping bag, jacket and few other personal belongings. I glance back at the porters who shoulder the bulk of our gear — tents, food, cooking gear and water. Their seasoned feet, shod only in flip-flops, move just as quickly, slowed only by a scattering of volcanic lava rocks. The first day is relatively easy, starting out at Semlabun Lawang (1,156m). Lush fields of padi give way to tall green grass and shrubs. By late morning, Mt. Rinjani is obscured by low cloud, but our excitement mounts as we climb higher and higher, deeper into the mist-covered shroud that hides the mountain. In the evening, the clouds roll back to reveal the mountain in all its beauty as we set up camp on the East Crater Rim. The temperature drops quickly after sunset, cooling off the tropi-cal heat, but sleep doesn’t come to us easily. The anticipation of an early morning start to reach the summit at sunrise and being awakened by the occasional ‘boom’ of a small eruption which seems to happen every three hours, keep us on edge. Eventually we do fall asleep, only to be shaken awake and offered tea and biscuits. It is dark but the air is crisp, clear and cold. 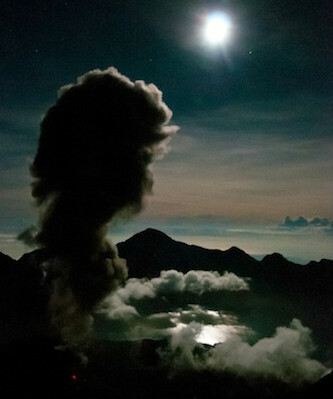 Every few hours, the ‘boom’ of another eruption makes us rush over to peer down into the crater lake, to see the flow of red hot lava and a plume of volcanic ash being emitted from Gunung Barujari, the active volcanic cone that resides within the crater lake. The path to the summit is on a ridge, so the views are fantastic in all directions. To the left lies the sea, to the right is the crater lake and Gunung Barujari, and above us looms the summit. The final stretch is a demoralising slog up to the summit on scree — take one step up and slide down a half step. We tough it out and persevere, and eventually, we reach the summit as the morning sun peeks over the horizon. We take a few photos, but don’t linger on the summit. A quick descent back down the scree slope is rewarded with a hearty breakfast prepared by our crew at camp. We will need all the energy we can muster, for this will be a long day that has just begun. Read the full adventure in STORM V27, available at Allscript, MPH, and Kinokuniya.